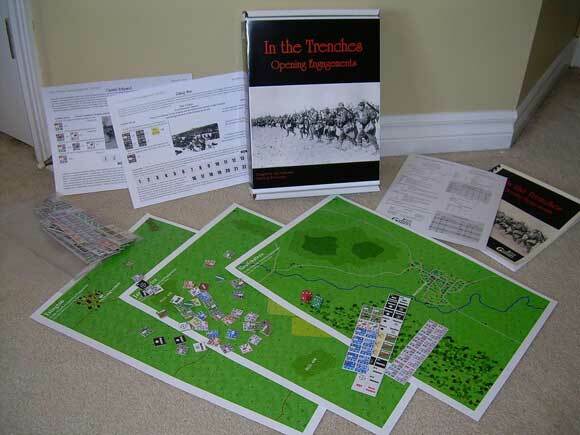 Our newest game, In the Trenches: Opening Engagements has now been released and is shipping. Please head to the Shop page to order your copy of this innovative WWI tactical wargame. Starting today, In the Trenches: Opening Engagements is now available for pre-order at the lowest price you’ll ever see! Once released, the regular price will be $55 CAD. Jeux Grenier Games will never list this game for a lower price. All we ask in return is that you wait until the second week of March for your game to be shipped, in order for us to build up a stock of orders to print ahead of time. Be among the first to order and get your hands on a copy of In the Trenches: Opening Engagements at this lowest-ever price! In the Trenches: Opening Engagements is the first game of the In the Trenches series. Designed by John Gorkowski, this series enables players to game historically accurate simulations of tactical operations from The Great War. ITT challenges players to move and fight with company-level formations made of separate platoon-sized units during 5-minute, impulse-based turns on historically accurate maps scaled to 100 yards per hex. This approach recreates WWI command and control problems to inspire historically accurate play without forcing decisions. The first game in the series, Opening Engagements, features a cavalry duel between Austrians and Russians on the Eastern Front, an encounter battle between the French and Germans in the Battle of the Frontiers, and the Japanese/British assault on German positions outside of the German colony of Tsingtao in China. Work on Distant Foreign Fields Continues!